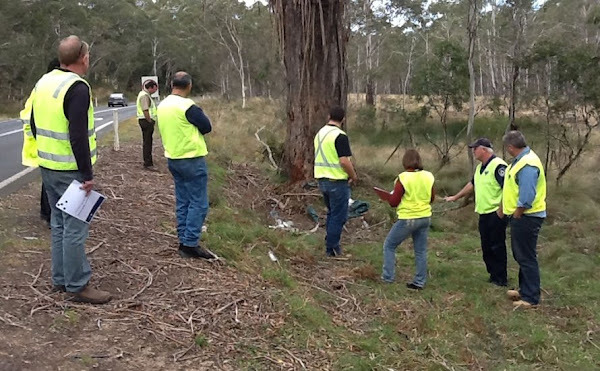 NSW Roads and Maritime Services is currently in the midst of a safety review of the oft-maligned Kings Highway. As part of this they’ve taken comments through a rather nifty online mapping tool, and these have now been collated and summarised in a 33 page report. The report includes the complete collection of comments received, a fair number of which are whinges about ACT drivers. They’ve also sent out a deputation of serious men and women with serious clipboards to assess the road in person. The next step is a safety review report to be handed to the NSW Government in August – after that any further action is in the hands of the politicians. They did this study with amazing speed. Lots of opportunities for people who lived along the highway to comment, and then blam, study released. Not bad! It’s Idiocracy type stuff though to screech for money to be spent on a road just because people crash on it. People crash on the road because of the way they drive, not the road. As every second responder to the study seems to have said, a few visible police would be cheaper than idiot-proofing the road. Barrell O’Farrell’s new fleet of speed cams might change things a bit too. Who wants to bet that some will find their way onto the King’s, and the Monaro? It’s a feasibility study for the best trees to nail fluffy toys to. They’re investigating the most commonly visited tree for roadside urination stops.